1 of 2 Heat oil in a large skillet over medium-high heat. Add garlic and cook 1 minute. 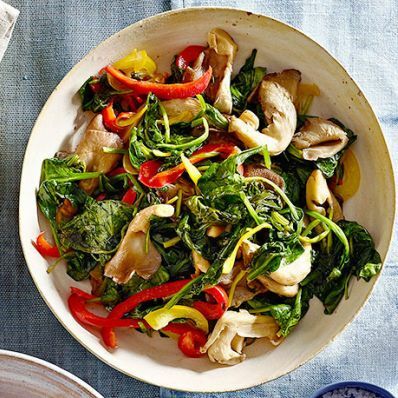 Stir in mushrooms and peppers; cook 4 minutes, stirring occasionally. 2 of 2 Gradually add spinach and stir until wilted, about 4 minutes. Stir in salt, pepper, thyme and marjoram. Serve with lemon for squeezing over the top.